The Dental Spa of New York provides a unique experience for our patients. We provide ultramodern dentistry with stress-reducing amenities. Our office is specifically designed with you in mind to make each visit anxiety-free and pleasurable. We have fresh baked cookies, a comfortable reception area equipped with massage chairs, and even a refreshment bar for your satisfaction. Your Park Slope dentist, Dr. Sapienza, believes in convenient, high-quality dental care with the most advanced technology to give you the best possible results. Let us pamper you while improving your smile with our innovative technology. Dental Spa of New York Cares About YOU! Your dentist in Park Slope has grown up with dentistry in his blood. He is a second-generation dentist and has been practicing improving New Yorker’s smiles for more than 30 years! Our practice makes you feel like family, just as Dr. Sapienza started—alongside his father in a family dental practice. He continues to bring the same friendly, loving vibes to his own practice and makes every patient feel at home. You can be confident in the services we provide because your dentist continues his education to keep up with the advances in today’s technology. After all, prevention is the foundation for a healthy smile. Dental Spa of New York is equipped with digital x-rays for early detection as well as intraoral scanners to produce 3D images of your teeth and gums. Not to mention, we use state-of-the-art sterilization technology, keeping our patient’s safety of the utmost priority. 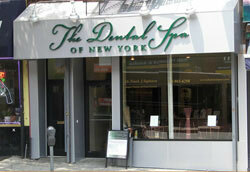 Dental Spa of New York only serves the best dental care. Intraoral Scanners—Carestream CS3500 is our intraoral scanner that makes your experience with us more informed and enjoyable. We use digital impression machinery rather than messy putty to visualize 3D images on a computer screen. You and Dr. Sapienza can view the images together and discuss the best forms of treatment for you. Dr. Sapienza and the team at the Dental Spa of New York would be delighted to use our advancements for the benefit of your oral health. We serve the Park Slope area, as well as surrounding communities like Brooklyn Heights, Cobble Hill, Prospect Heights, and Carroll Gardens. Contact us today to experience the most relaxing dental visits in the Brooklyn and Queens area.